Mariell Handmade Ivory Pearl Bridal Bracelet and Earrings Wedding Jewelry Set Accented with 14K Gold Plated Cubic Zirconia Roundels. Bracelet Adjustable to Fit Every Wrist From Petite through Large Sizes, Matching Pierced Earrings Measure 1 ½" High by ½" Wide with Pave Tops and Fishhook Backs. Mariell's hand-strung Ivory pearl wedding bracelet and earrings set features a lovely blend of 6mm pearls highlighted with shimmering 14K gold plated round cubic zirconia pave frames. This beautiful yellow-gold accented pearl bracelet is adjustable from 6.5" to 7.75" long to fit all most any wrist from petite to large with a one-of-a-kind design. Our hand-crafted bracelet features a graduated single strand of Light Ivory pearls aglow with unique round CZ accents. We love the "dress up" or "dress down" versatility of the delicate pearl confection as it gracefully transitions from day into evening wear with the understated simplicity and delightful "Breakfasts of TIffany's" elegance. 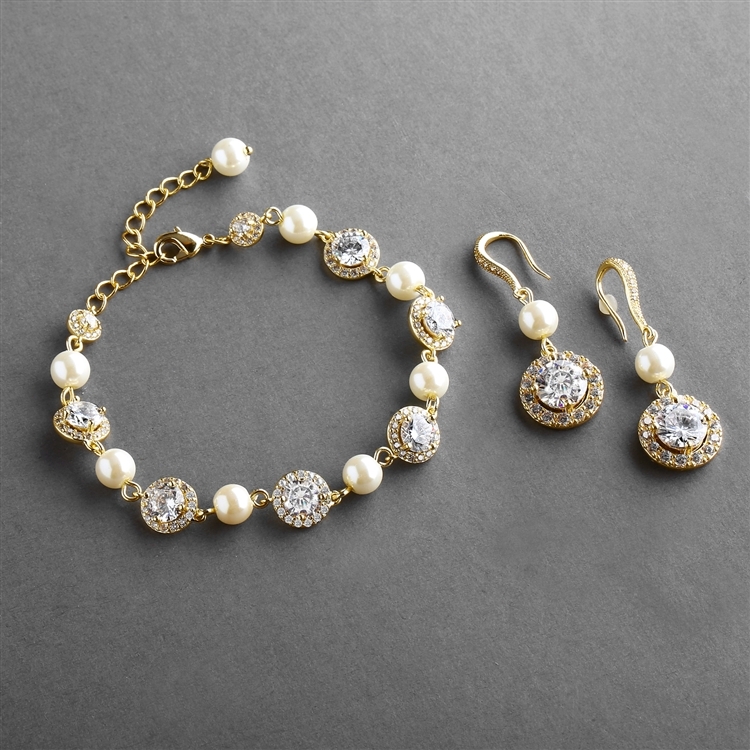 We promise you'll adore this lovely gold and pearl special occasion bracelet and earrings set or your Money-Back. Treat yourself or someone you love to the sophistication of pearl jewelry with a hint of diamond sparkle.... at an irresistibly low price. As always, enjoy Mariell's exclusive 100% Risk-Free Purchase and Lifetime Guarantee.